rating: 4/5 [in the genre] or 7/10 [all books I’ve ever read]. recommended for: Fans of The Murmurings by Carly Anne West, ghosts, the occult, and realistic characters. People looking for an emotion-driven mystery. Ever since the car accident that killed his twin brother, Marshall Windsor has been consumed with guilt and crippled by secrets of that fateful night. He has only one chance to make amends, to right his wrongs and set things right. He must find a Thin Space—a mythical point where the barrier between this world and the next is thin enough for a person to step through to the other side. I think I finished this book in a few days. It was dead compelling, with a fast-moving plot, endearing characters, and a twist that blew my freaking mind. Yes, it's an italics-worthy twist. What drew me to it was the classic paranormal element: the thin space. It's something you hear in Celtic ghost stories and tales of Halloween, and I was sold. It starts with a tragedy and a mystery. Marsh has just lost his twin brother in a car accident, and something happened that night. Something Marsh fears to tell even in his narrative. You get snippets along the way and I ate them up like the squirrels following Hansel and Gretel. All the hints make the final reveal satisfying, but still shocking. Marsh is immediately endearing. He's odd, troubled, and has a weird habit of going around barefoot. Then there's Maddie, his sidekick with her own secrets. Their growing relationship is sweet and organic--and not without some shockers. By the end, I was ready to hug Marsh to pieces. I was so invested in what happened to him. And I felt totally satisfied by the wrap-up. Overall, it just has an atmosphere that I can't put my finger on, something that's stuck with me long after the last page. Just when you think you have it all together, Casella goes, "Hahaha, no, you silly reader! You missed this clue!" and flips it over. 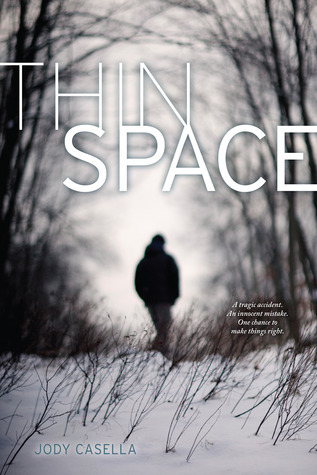 I actually was kind of hoping that thin spaces would be a myth and it would be more about the grief process, but no worries--it's totally fantasy / paranormal! And I still loved it. It's a weird cold start, almost (I know, that's a total misuse of the term). You know there was an accident. You know Marsh is scanning the whole city barefoot. You know his late elderly neighbor told him about thin spaces. And then the mystery unfolds. What happened that night? Why is Marsh so desperate for the thin space? Why is Maddie so eager to help him? Someone tell me!!! It's kind of cool because the Marsh-Maddie friendship starts as a sort of manipulation, and grows into something much sweeter and stronger. Then there are the teasing hints of the accident night to keep you guessing. The climax was so twisty. I never saw it coming, and it totally made everything make sense. It ends abruptly, but not in a bad way. You already know about how things will end up, and you have hope. It's not a super unique concept. There are many books in which someone loses a loved one and tries to contact the dead. What makes it so likable is how Casella deals with it and how she shows it through the characters. The thin space becomes this Holy Grail--Marsh's last desperate attempt to reclaim his lost brother, even though he has no idea what will happen on that other side. The thin space itself wasn't that developed, but it served its purpose. So in all, it sort of became as much about grief and moving on as it was about the fantasy. I loved how human it was. It wasn't just about supernatural goings on. Mostly, Marsh and Maddie occupy the stage. We get snippets of Marsh's twin Austin in the flashbacks, and their ex-girlfriends, and Marsh's former friends, but everyone is on the periphery. It works, because that's how Marsh feels. He's totally secluded himself from everyone else in service of his one, obsessive goal. The only one to get through is Maddie, and at first she's only there as a tool. It's only later she becomes a friend. As she and Marsh become closer, we get to see more of Marsh. We find out some of her secrets too, and it makes her less of a manicpixiedreamgirl and more of a real person with her own stuff. I'm rambling. In general, Marsh is really likable. You see how he's hurting his parents and his friends, but you also sympathize with him. I could see the pain he was feeling and how lost he felt. I also saw his insecurities and his deep, devastating remorse. His grief is complex and gives him depth. I thought Maddie's brother was a little flat and pointless except to add some drama, but he was the only one. The style was very simple but with some pretty touches. It doesn't go out of its way to be clever. This is about the story. About Marsh's voice and his struggle. It's good, clean writing that allows the plot to shine. The pacing is fantastic. For a plot that has a lot of walking around barefoot, it never feels dull. There's always something going on, whether it's Marsh dealing with his own past demons or dropping hints about the accident or building his relationship with Maddie or dealing with the fallout with his family and friends. It's a quick, exciting read. An exciting read that blends the process of grief with an atmospheric supernatural bent. Note: I received this copy in exchange for review. The price of the book and its origin in no way affected my stated opinions.